It feels like we were just taking down the Christmas decorations, and now it’s almost April! And guess what happens in April? We’re releasing not one, but TWO games. This is the first time we’ve ever released two games in one month, so it’s going to be very exciting! First up is Durian Dynamite on the 9th of April, which is shortly followed by Tales of Dr. Dolittle two weeks later, on the 25th of April. Durian Dynamite is a classic fruit game in a modern package, combining stunning 3D graphics with highly volatile gameplay – these fruits look so good you’ll be tempted to take a bite! 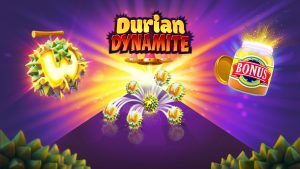 Add to that the completely unique Dynamite Wilds feature with Durian fruits that explode and multiply all over the screen, plus an interactive Bonus Picker that keeps things exciting by giving you completely random free spins upgrades. Our team had a blast working on this game! Tales of Dr. Dolittle is based on the series of classic novels from 1920, and it pays homage to the world’s most famous animal whisper – a slightly odd doctor with the ability to talk to animals. In this game, you get to hang out with him and his parrot, horse and dog! It’s a fun-filled and exciting 5×3 reel slot with 25 active lines and features like Free Spins, Respins, and Multiplier Wilds! This animal adventure expands our portfolio of character games, which includes popular games like Big Bad Wolf and Goldilocks. And with spring here and the Easter weekend happening at the end of April, why not run a Tournament with an Easter theme, or a Challenge with a spring theme? 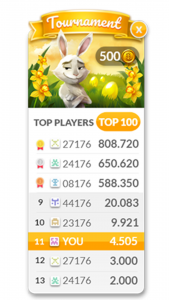 These gamification tools are fantastic customer retention tools that add lots of excitement to the games! And by using one of our many customizable themes, you make sure your offering always stays fresh and exciting to your customers!